Went to see the thoracic surgeon today. drove me, as I was extremely stressed out. The thoracic surgeon is young, capable and has an excellent chairside manner. This is much like my colorectal surgeon, frankly, though you’d never confuse the two of them. 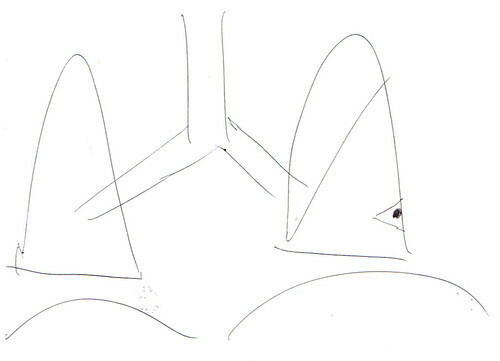 He started by asking me a few questions about my medical and surgical history, and then drew a diagram of my lungs. He discussed the rationale behind surgical addressing of the tumor — more than 12 months since the original tumor, and five or fewer lung lesions, is the most optimal combination, and I fit that profile. He showed me the actual size of the tumor, its site in my left lung, and discussed the surgical plan. They are going to use remote instruments with video camera through an incision beneath my arm and another between two of my lower ribs. He says in this type of surgery, there’s about a 10% chance of needing to go to open incision if he cannot get a good enough view of the tumor site, but that my location is very “easy”, and he does not expect that. If an open incision is needed, it will be about five inches long, and involve using a rib spreader. The surgeon characterized this process as an order of magnitude less invasive and difficult than my colon surgery of last year. 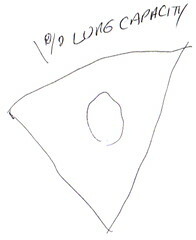 He will take out a chunk of lung about the size of a Dorito, centered around the tumor. It looks like a nacho chip with a jalapeno sitting on it. This will represent approximately 1% loss of lung capacity for me, post-op. That piece will go off to be biopsied, I will have a chest drain temporarily installed, and can expect about three days of in-hospital post-operative recovery before I’m released to go home. Release criteria are the drain clearing (and then being removed), and my general recovery from pain management to a point of oral medication in lieu of IV. We do not expect the GI issues associated with last year’s surgery. Complications include bleeding, sepsis, and chronic pain syndrome, each with about a 1% incidence. Some chronic pain sufferers also experience a phantom sensation of shortness of breath. All of these complications are at least partially treatable. There is also a 0.1% risk of death due to heart attack, adverse response to anesthesia, etc. Post-operatively, I can expect the chest drain and an epidural for pain management, along with the usual fun with catheters and IVs. I will be heavily medicated the first few days, and can expect about two weeks of bed rest when I get home. I think he’s being a bit conservative, even last year’s surgery had me up and about on a limited basis by three weeks, and this is much less of an insult to the body. I will initially plan to take that Wednesday off from work, all of the following week, and then play it by ear from there. The surgeon estimates six weeks to full recovery. His assessment of the likelihood of the tumor being metastatic colon cancer varied widely from my oncologist’s. The surgeon felt it was 70% likely to be metastatic colon cancer, 10% likely to be a primary lung cancer, and 20% likely to be a lesion from some other source such as infection. (By contrast, the oncologist quoted 97% as the likelihood of this being metastatic colon cancer; a number which an epidemiologist friend also arrived at through independent number crunching from published medical data.) Note that the tumor had a SUV (standard uptake value) of 2.9 on the PET scan, which is indicative of cancer. Once the tumor is biopsied, I will meet with the oncologist to plan chemo and otherwise evaluate options going forward. I am querying her as to when she’d like to meet, but I can’t imagine that will be prior to 12/7. Given the surgical healing times cited by The surgeon, I don’t expect chemo prior to Christmas/New Year’s. We have scheduled surgery for Wednesday, November 25th. I will be in the hospital at least through the 28th in post-operative recovery. (For those of you keeping track of such things, this means I will miss OryCon. I am contemplating a virtual panel in my hospital room for those of you willing to trek across town to see me.) Surgery is set for 7:30 am, with me having a 6:00 am checkin time. I do not currently know the expected duration of the surgery, nor the expected recovery room time prior to being able to receive visitors. What does this all tell me? Well, it reinforces that medicine is an art as much as a science. It confirms that this sucker is a problem, and is being addressed. But most of all, this tells me once again that when I have a course of action, no matter how dreadful things are, they are much more manageable than when I have only uncertainty before me. I expect the Fear will be a regular friend to me in these next few weeks, and I have a long-time horror of anaesthesia, but I will pass over these, too. In the mean time, I believe I shall refer to my impending dip into surgery as a “nacho-ectomy”. But the real question is, do they have good roast turkey at the hospital. I mean, if you’re going in for the duration, the least they can do is feed you right. Of course, at that point you’re probably going to be barely conscious so they could feed you jello and tell you it was the best turkey and you’d believe them. …wishing you all the best in the days to come, Jay. Wishing all the best for you and hoping for the best possible outcome.